Elvis Jacob Stahr Jr. was inaugurated as president of Indiana University on November 19, 1962. He is the successor to Herman B Wells. Dr. Stahr came to IU with broad experience. 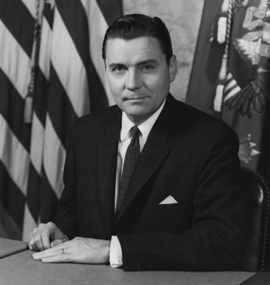 He had been a Rhodes Scholar, a practicing attorney, provost of the University of Kentucky and University of Pittsburgh, president of the West Virginia University, and Secretary of the Army under John F. Kennedy. In 1966, the he established awards to honor IU seniors who excelled academically while serving as active campus and community leaders. In an open letter to the award recipients, Dr. Stahr wrote, "You have already distinguished yourselves and honored your Alma Mater, and I encourage you to aim high in both your personal and your professional lives. I am confident that your futures hold ever-increasing opportunity, challenge, distinction, and reward." Each year, the Elvis J. Stahr Distinguished Senior Awards are presented to three to five students.